I’m sure most of you eating bread almost every day. And I guess you have pretty much leftovers, which going to be mouldy or dry out. My decision is not to buy or eat less bread, is to make your own homemade breadcrumbs! Of course, you can make a bread pudding or French toasts with the leftover bread, but I bet you do not always have a time to prepare it in the morning. 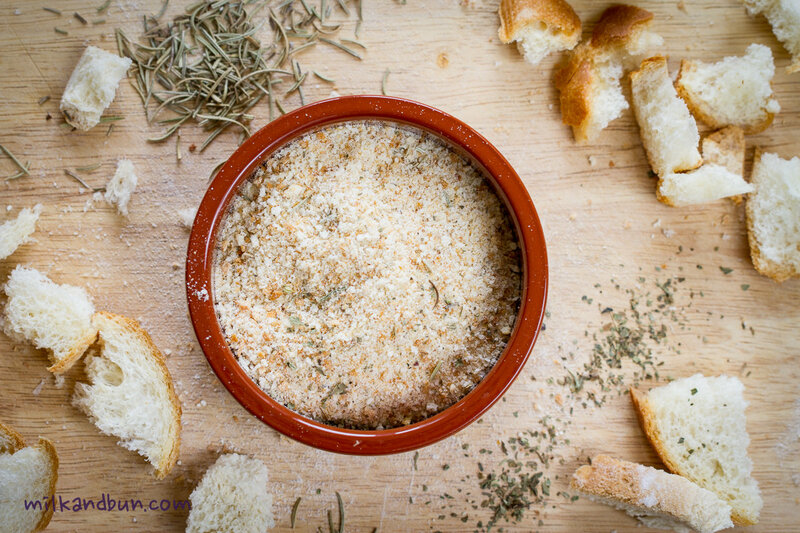 Easy to follow steps allow you to make aromatic breadcrumbs, which is extremely good and more tasty than store-bought, and you know all ingredients you’ve used. Include different types of bread and play with herbs, I prefer rosemary, thyme, basil, sage. Breadcrumbs should be store in an air-tight container, or even in the freezer. When you need some, just spoon out the amount of breadcrumbs you need. If you have only few leftover bread slices, cut them into cubes, put into a freezer bag and place in the fridge. When you’ve got more leftovers, keep adding bread pieces to the bag until you have enough quantity. Then follow the recipe steps. Cut bread into small pieces with a knife, then arrange on a baking tray. Bake in preheated 160-170C/150C-fan oven for 20-30 minutes or until bread pieces is golden and crispy. Put bread pieces into a food processor along with dried herbs and blend to a small crumbs. You can also put bread pieces into a plastic bag and smash it with a kitchen mallet. Put into a glass jar/container and cover tightly. Or put breadcrumbs into a freezer bag and keep in the freezer. Apr2April 2, 2015 • By milkandbun • This entry was posted in Uncategorized and tagged aromatic breadcrumbs, breadcrumbs, DIY, food photography, herbs, homemade, homemade breadcrumbs, leftover bread, photo, photography, recipe. Bookmark the permalink. Great simple post Mila. Freezing is a good tip because I’ve found that if you make breadcrumbs and then leave them in the pantry they can start to go mouldy – I never thought to extend their shelf life by freezing. Happy Easter! I make soft breadcrumbs too, but sometimes I dry all the odd pieces of bread in a slow oven, reduce them to powder in the processor then use them as a crumb coating for schnitzels. This is something I always wanted to be able to make. Now I have a great recipe, thanks for sharing. Thanks for this lovely share, Mila 🙂 Seems brilliant!